It’s been a REALLY long 2 weeks down here in Ocala. From the long hours at the barn, to the endless number of torture circles, to waking up with loose crickets in your bedroom……it has been a very long 2 weeks. The good news is that it has also been a phenomenal learning experience. I have learned more in the 2 weeks I have been here than I have learned in the last year, and the results are amazing. 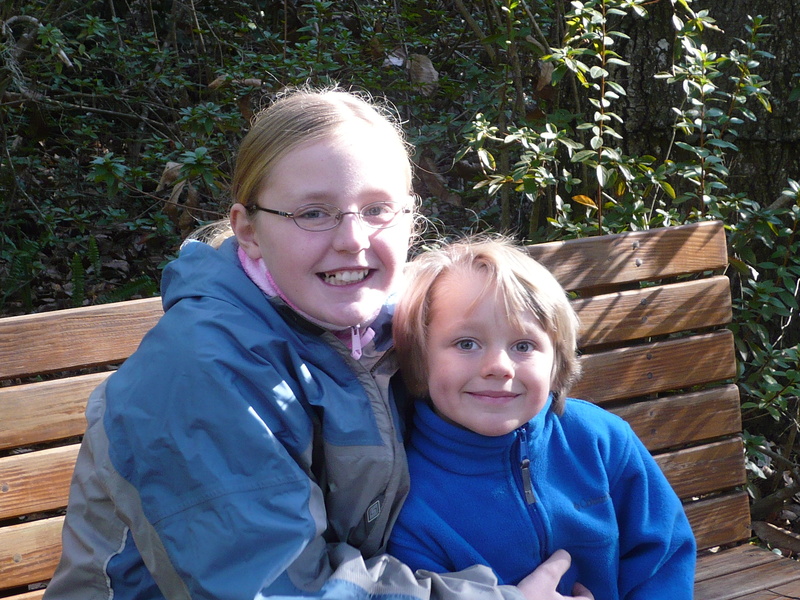 This past Friday we loaded up all 6 horses and went to the Rocking Horse Stables Horse Trials. 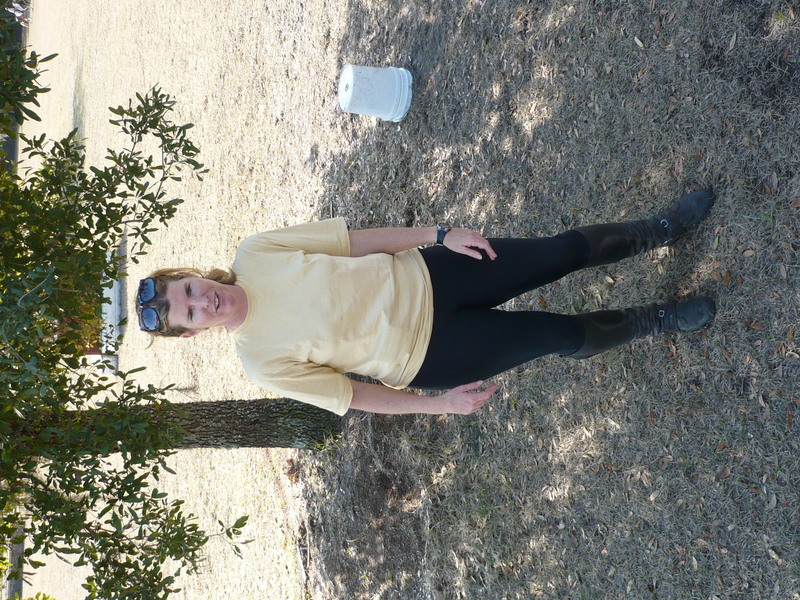 Michelle and Pickles were doing preliminary dressage and show jumping on Friday while the rest of us just did flatwork on the property to get our horses exposed to the chaos a day early. Michelle got a 40 on her dressage test (which was not as low as his usual test). Though she was a little dissappointed with her score, it put her into 10th place after dressage. She had a great show jumping round with a double clear. She moved up to 8th after show jumping. Gus and I took a lesson at the show. Dorothy gave me my warm-up routine for the show on Saturday. It went something like this…..
Pet him and put him away after 20 minutes of riding. My horse never broke a sweat. 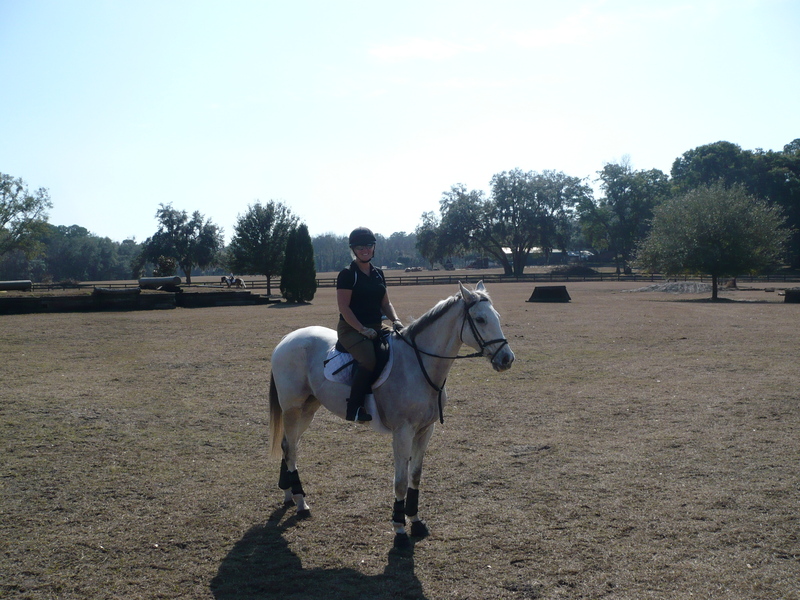 It was 70 degrees, and my saddle pad was not even damp. Who is this horse???? I was scheduled to do dressage at 12:15pm. I got on at about 11:45 am. We did our warm-up as if we were in a coma. My test was sooooooo relaxed that I kept worrying he would break into the walk. I had more time to think about where I was going than I have ever had. You might even call the test “sluggish”. It was unbelievable. I was sooo happy with how he listened. Dorothy was thrilled when she watched the video of my test, but I had yet to see my score. I went to warm up for my 3pm stadium ride at 2:40pm. 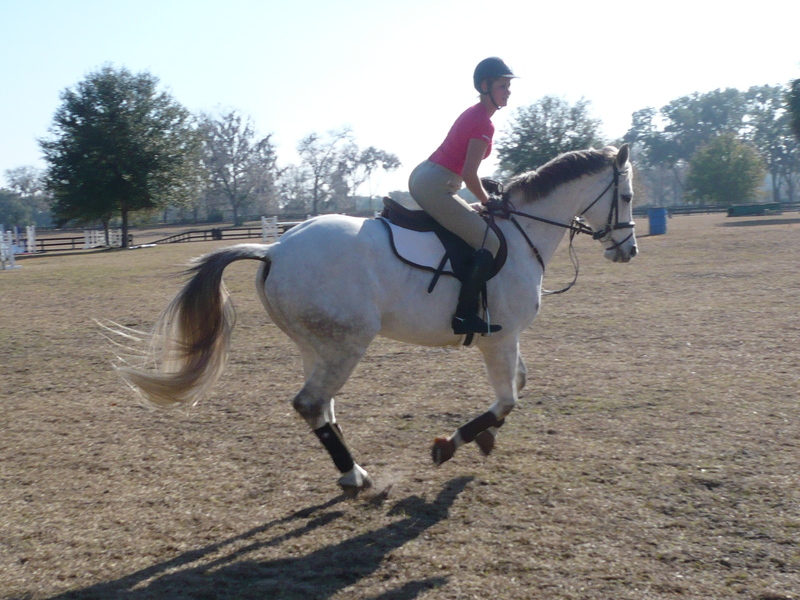 We did our dressage warm-up for stadium as well. After a few minutes of that, I went on to jump the crossrail, vertical, and oxer in the trot. He was quiet as a mouse, so I went on and cantered a few fences. 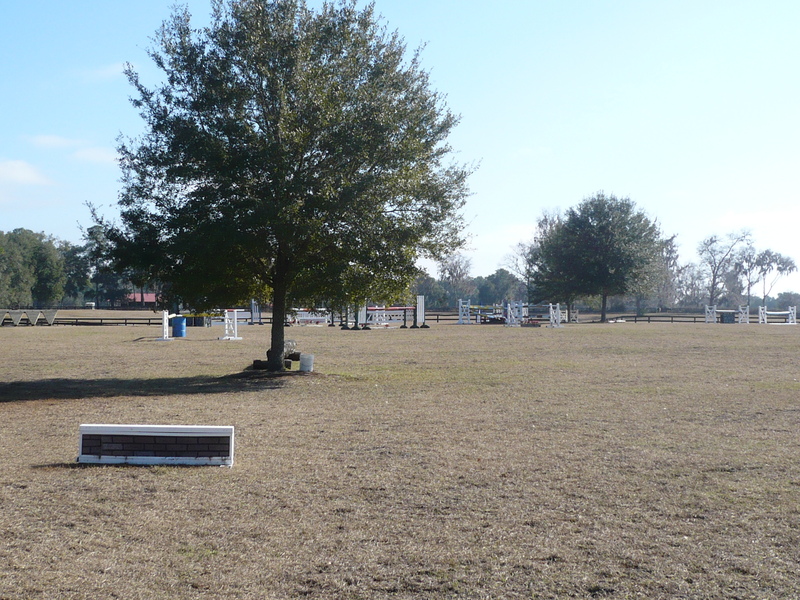 Dorothy was finished with her last dressage test, and hid across the field to spy on me while I warmed up. She was really excited, and told me that if he was that quiet I could canter quietly over some fences in my stadium. I hung out at the in-gate, while Gus slept standing up at the gate. They blew the whistle, and I quietly squeezed him into a trot to trot up over our first fence. It was perfect. He cantered slowly and quietly between the fences (in my french link dressage bit) and even got 3 perfect strides in the 2 stride combination. We had one rail down at fence 2 because I was trying to decide whether or not to let him trot or canter it. I finished the course with 14 time penalties on a novice stadium course!!!! I laughed out loud like an idiot when I found that out. I have NEVER had time penalties in the stadium before (unless I had major trouble with a fence) and especially NOT at novice! Dorothy was thrilled again. She was so excited at how well he listened to me between fences. I have never seen the horse so relaxed before. Besides the day being a great success for Gus and me, I also got to chit chat with Leslie and Lesley Law, Jim Graham, Jen Holling, and Robin Walker. Karen O’Connor introduced herself to me and shook my hand! 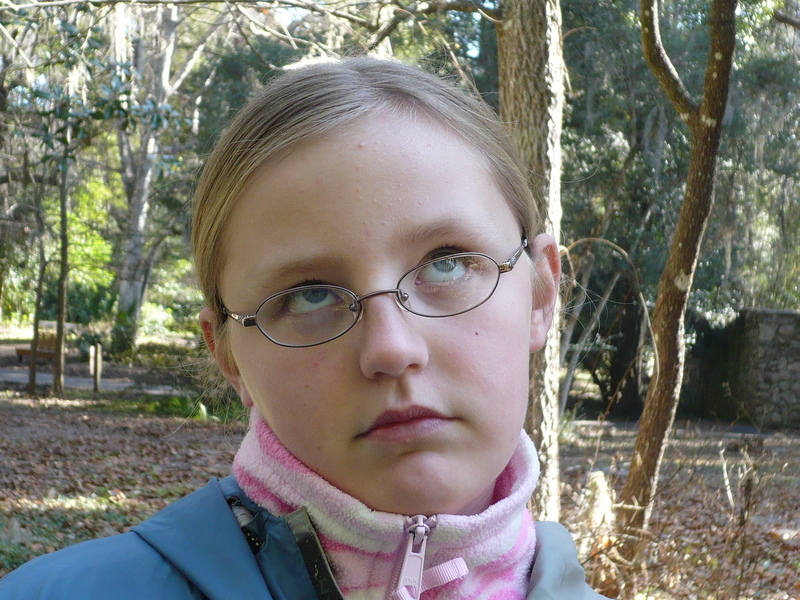 Chelsie was really jealous of me. It was a really great day. Dorothy and I went out Saturday evening to walk our x-c courses. It looked like a fun course. Big enough to feel like x-c, but small enough to focus on our ride. I could not wait to be in the start box with Gus again. I was the first to ride on Sunday. I got on in time to have a 20 minute warm-up. The warm up for x-c was CHAOS. Gus was a bit frazzled by all of the galloping horses around us. I torture circled my way around all of the trees, jumps, and other riders. He was still wound up, but mostly listening. Dorothy warmed me up, and then helped me get Gus into the box. I was surprisingly calm as he leaped around in the box. Dorothy wished us luck, and off we went. 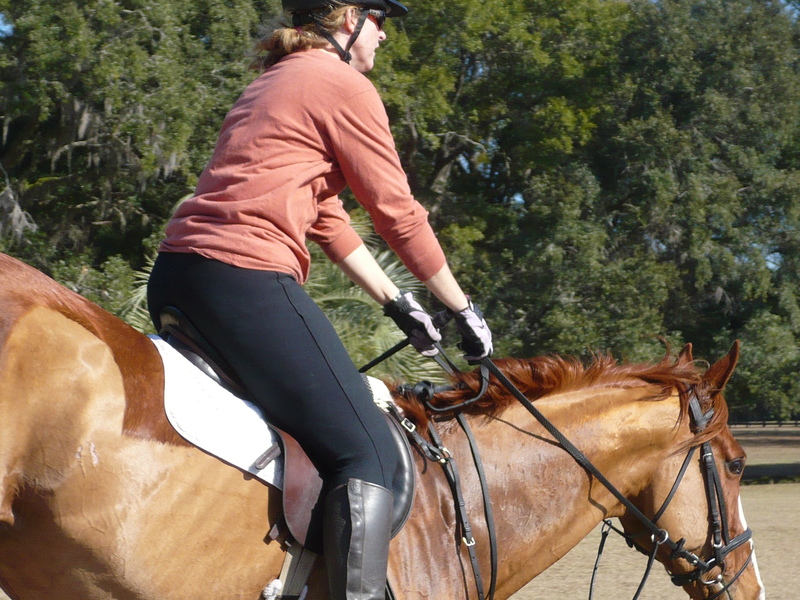 He actually trotted out of the box and up over the first fence (in a french link snaffle—–in a TROT). The rest was in a quiet canter. He was listening like a champ. We wound our way around the x-c course as if we were out for a quiet trail ride. As I made the approach to our last fence I heard a strange noise…….what is that ????? Gus was getting a bit nervous as I heard someone yell “I’m coming up on your left!”. HOLY CRAP! I AM BEING OVERTAKEN BY ANOTHER RIDER! I burst out laughing as I torture circled Gus off to the right to let the man pass by. Gus and I composed ourselves and finished the course——about a minute slower than optimum time. Those of you that know me and Gus know that that has NEVER happened to us ever before. I think it sort of startled us both—in a really funny sort of way. And that is how the weekend ended. Dorothy was thrilled with all 3 of our phases. Gus never broke a sweat all weekend. I felt as if I had won the olympics……and yet we were dead last. In 2 weeks we will do our first training level event of the season. In 3 weeks (if all goes well) we will do our first prelim of the season. In the meantime, we will be working our butts off in our daily lessons. This is the beginning of great things for Team Wetherbrooke. Today was stadium day! I did my dressage test as my warm-up, and though I did it in the cross-country field, it went well. Then we moved on to jumping. Gus was great. I am not allowed to canter single fences yet, so Gus and I trotted (yes, trotted) 3ft. high (or higher) fences the entire ride. I was allowed to canter in the middle of a combination, but that was it. 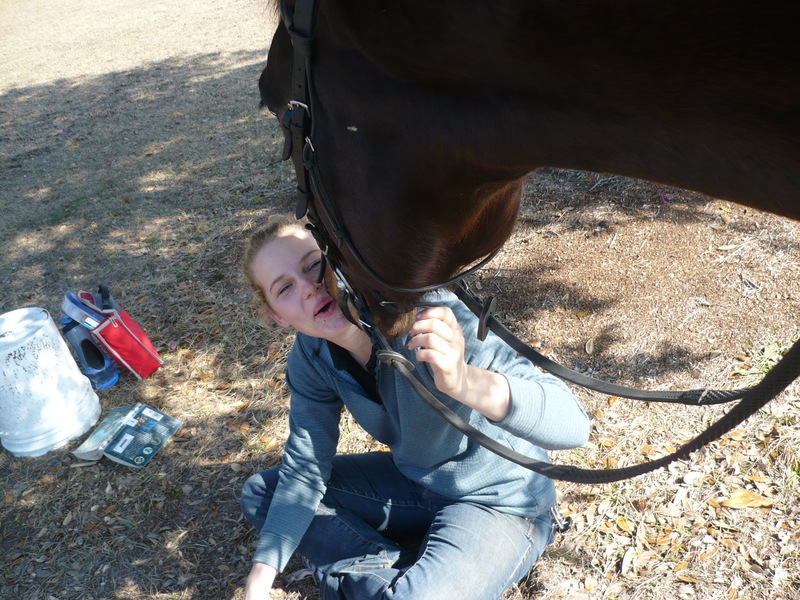 Other than getting tossed out of the tack many times (which Dorothy laughed hysterically at), we did really well. At times, Gus would WAYYYYYY over jump a fence and I would just swear I was coming off, but I didn’t. He listened most of the time, and when he didn’t I could fix it. At the beginning of the school, Gus decided he would lay on my left hand and took a whole standard (and all the rails with it) down with my kneecap. The next time through he decided that he would just stay on his line and carry himself. I was just thankful it was not a cross-country fence which would have taken my knee right off. Tomorrow we head to Rocking Horse Farm. We leave at 8am to go and watch Michelle and Pickles do dressage. We are taking all of the horses so that we can take our lessons there. Then we will walk courses, watch Michelle do stadium, and get ready to go home. I will do my dressage Saturday morning, stadium in the afternoon, and x-c on Sunday. I am actually looking forward to it. I will probably not write again until the end of the weekend, so wish us luck. I am just hoping to not get eliminated in our “new Style”. 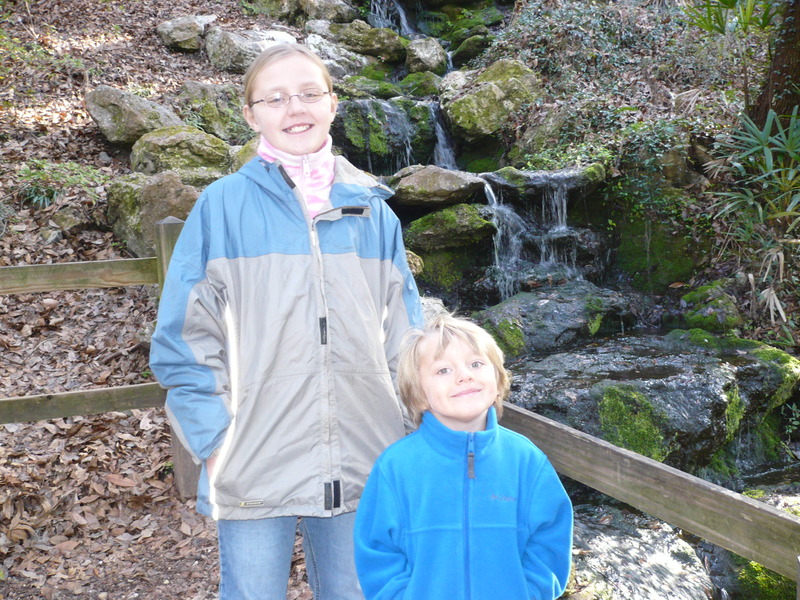 The kids and I visited “Rainbow Falls” state park this morning. 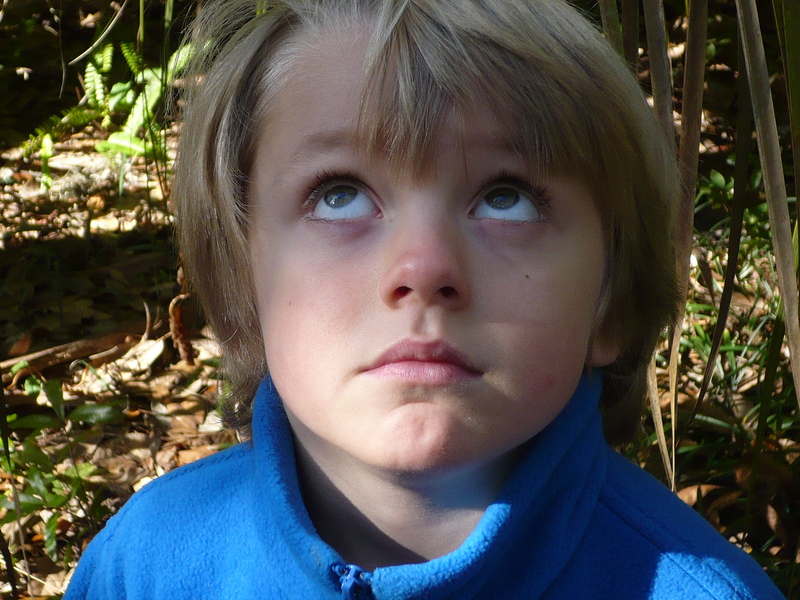 They were a bit on the wild side, so running the trails was good for the wild urchins. We saw a few water falls, a hot springs swimming hole, and a whole lot of not so pretty foliage. I don’t think January is a great time for blooms. 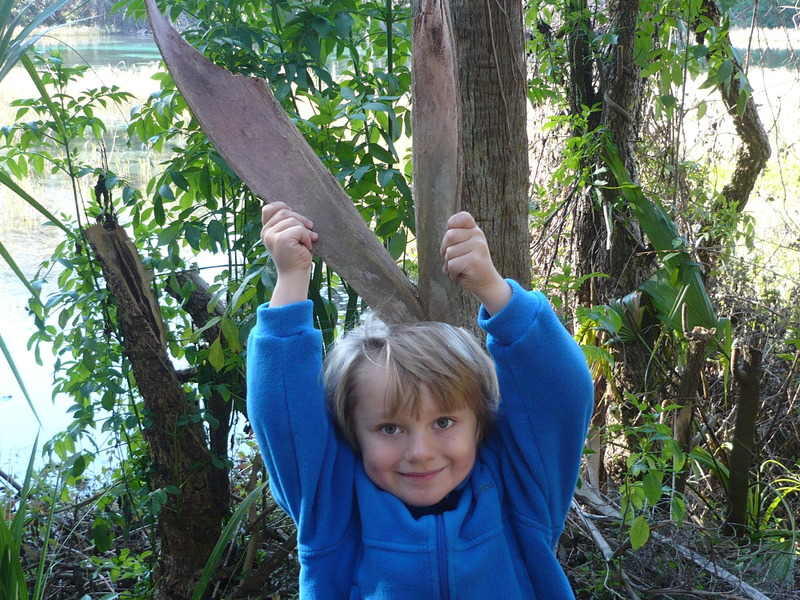 The butterfly garden was butterflyless, and the swimming hole was swimmerless. We may have been the only people in the whole place at 10am. It was like our own private ghost town. The kids had a blast, nonetheless. They enjoyed their photo shoot and looking for “wild squirrels”. 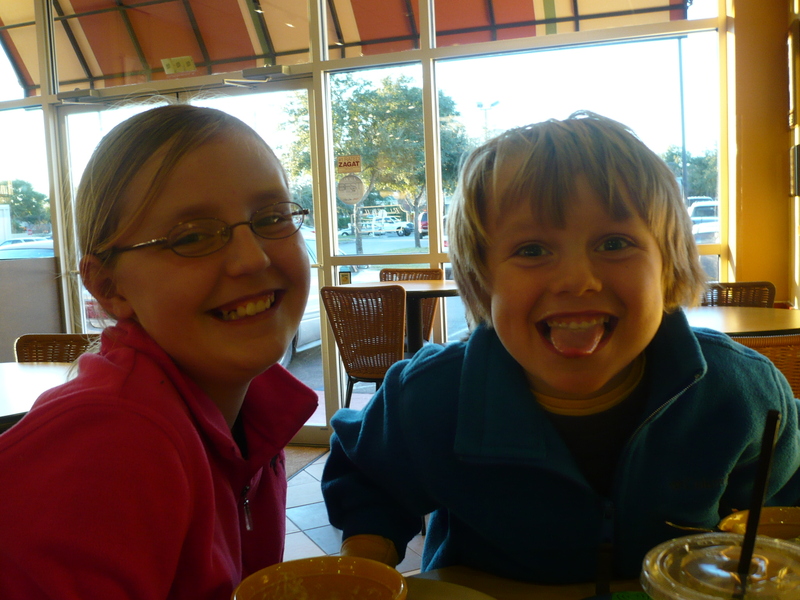 The kids and I are hanging out at Panera a lot this week. We come here to do our computer work (and they play their DS). The kids get the Mac and Cheese (which is AWESOME) and I get the chili (which I am now addicted to). I also ordered a celebratory Mt. Dew. For those of you that know me, that is a HUGE reward. Today is the beginning of a good show week. Tonight we will head out to Wal-Mart to pick up a few things for the barn, and then we will head back to the “department” (as Wade calls it). Kate and I are going to watch “Lord of the Rings” while the boy goes to sleep in the closet (which is bigger than his old bedroom!). Life is good in Ocala—–at least today. Tuesday was a BREAKTHROUGH DAY for Team Augustus! Monday evening, after my lesson with Pickles, I asked Dorothy what she thought about me and Gus getting this whole thing figured out. She said that she had faith that I would get it and that he would get it, but she had her doubts as to whether we could fix the way we rode as a team. I left the barn with a bit of a challenge going on in my head. The competitor in me started to wake up. So this weekend will be Novice. I am hoping to do Training and then Prelim. after that. We will see how it goes. Gus will be doing Novice this weekend at the Rocking Horse #1 Horse Trials. Yep….his first novice in 3 years. Dorothy Crowell, 2 time olympian and WEG team member may just be on board. Though we are getting better and better with our new style of riding, we may not have it together enough to make it through a training level event. Dorothy rode him again today while I rode Michelle’s Intermediate horse “Pickles”. Pickles already knows all of this “torture circle” stuff, so it was easier for me to see how it worked on him. I felt really good about the ride when I was done. He did almost dump me on the way back to the barn, but I survived. Nothing like a ginormous horse leaping around in the air to make me feel like a complete and utter pansie. So today was considered a “hacking” day for Gus. Tomorrow we will get back to the grind. Dorothy is doing everything in her power to get me ready to ride Saturday. I never thought I could be so worried about Novice. The jumps are a non-issue……whether or not I can steer him well enough (in my new style) to get to them is a HUGE concern. Kate and Wade have been troopers. They aren’t used to running around all day in the sun, so tonight they are bone tired. 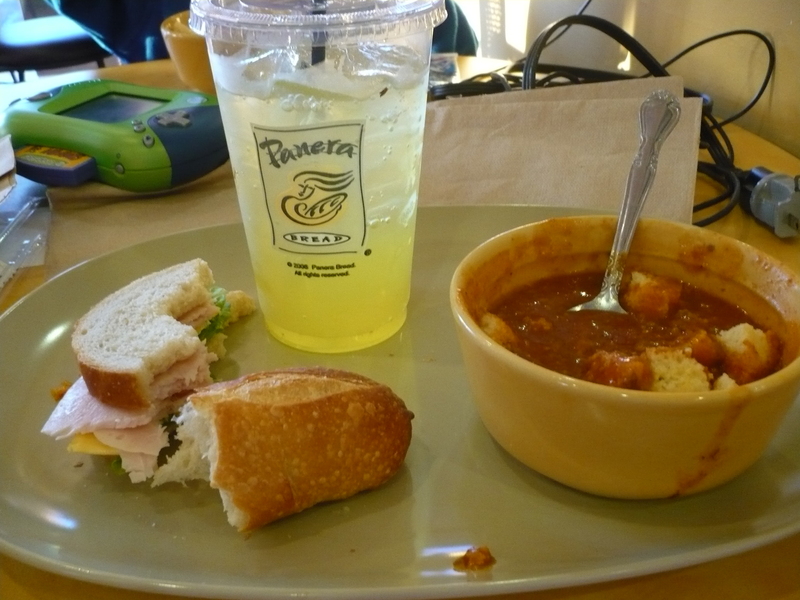 We are sitting in Panera after a great meal. They kids are playing their video games, and we are headed to Wal-mart after that. I think they have earned a new game after the day they have had. Today was my chiropractor and massage therapist day. Dorothy requires all of her students to have routine work done so that they can ride to the best of their ability. It could also be that she darn near kills us in lessons every day, and we are so messed up from the “torture circle” that we need help badly. Either way, Clark (the massage therapist) is my new best friend. I had no idea just how messed up I was until I stepped out of his office feeling fantastic! I have never had a medical massage before, and let me tell you I”M ADDICTED. Clark and I will meet again soon……..very soon. The kids are in town!!! Kate and Wade arrived on Friday night to stay with me for a week. It was so good to see them and their smiling faces. We spent the night in the apartment on Friday night, and then we went to Orlando yesterday. It was really nice to get away from the barn for awhile. Michelle and Chelsea were nice enough to take care of Gus for a few days for me. He was supposed to be off today since he did some x-c yesterday, but Michelle wasn’t sure if Dorothy would let him have a day off. I am still in Orlando, so Gus could be doing his torture circle as I am writing this. I sort of hope that he is. 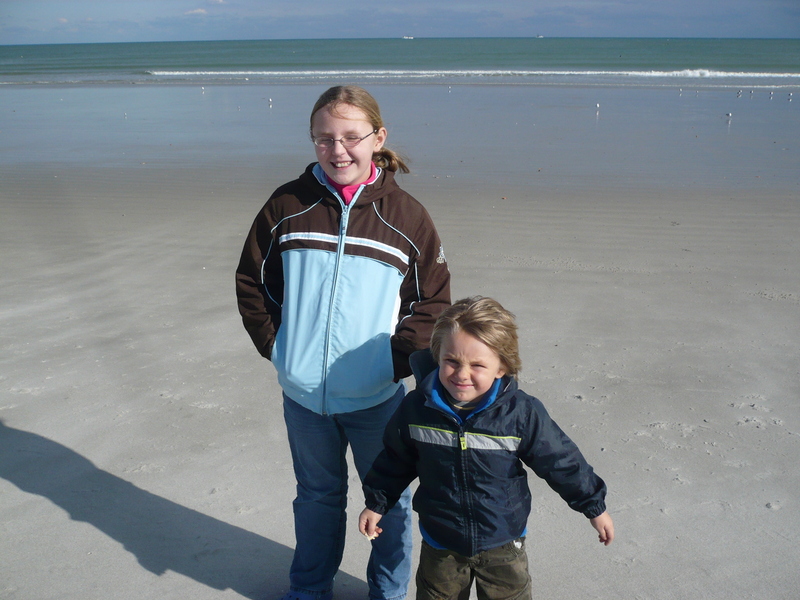 We went to Cocoa Beach yesterday. It was only 60 degrees (I know that sounds hot to you all at home), so we were in sweatshirts and jeans. The kids hunted for seashells while we walked the beach. I have about an hour before I need to check out of the hotel and get back to reality. It has been a nice break. This has been a really good and really disappointing week in Florida. Gus had last Saturday off. On Sunday I took him for a long walk to let him see the property and get his legs stretched out a bit. On Monday we began our week of “the Torture Circle”. It takes way too much time to explain, but it’s the thing that Dorothy starts out doing with all of her new students. I am starting to figure it out, but Gus has been rebelling like crazy. Yesterday we were supposed to school x-c. Gus started our really well, but then Jon Holling and a couple of students started doing gallop sets nearby. He started getting all wound up and would no longer focus on me. I put him back on the torture circle, but he was so mad that he tried to rear with me several times. Dorothy ended up getting on him (for the 3rd time this week) and finishing the lesson for me. In the end (after hour 2) she was able to get him to carry himself for short periods of time, and then he was allowed to jump a few small x-c fences. 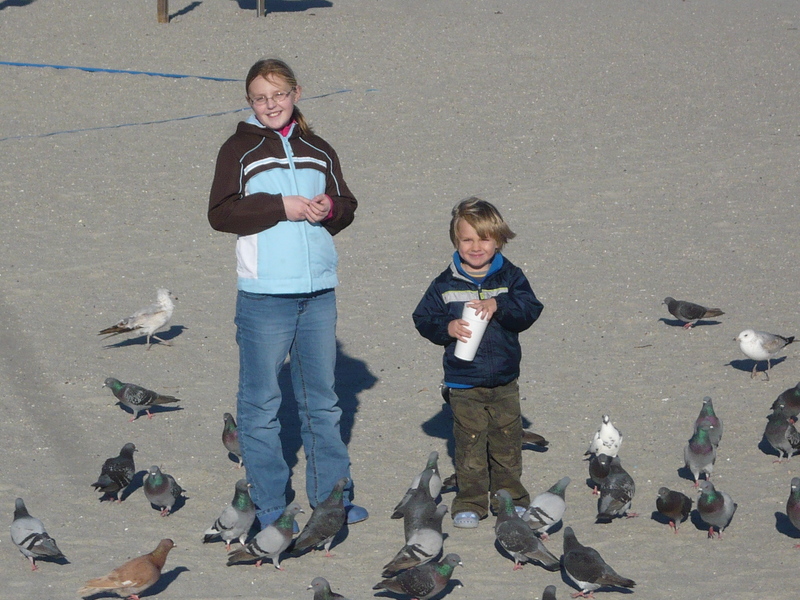 She said that if she would have had Gus at age 9 he would have been going to Rolex with her this year. I’m not sure if that was supposed to make me feel better or worse, but it definitely made me feel worse. I have always known that my horse was super talented and athletic. The problem with Gus is that he cannot get it together between his ears. I am so frustrated with him that I can hardly stand it. 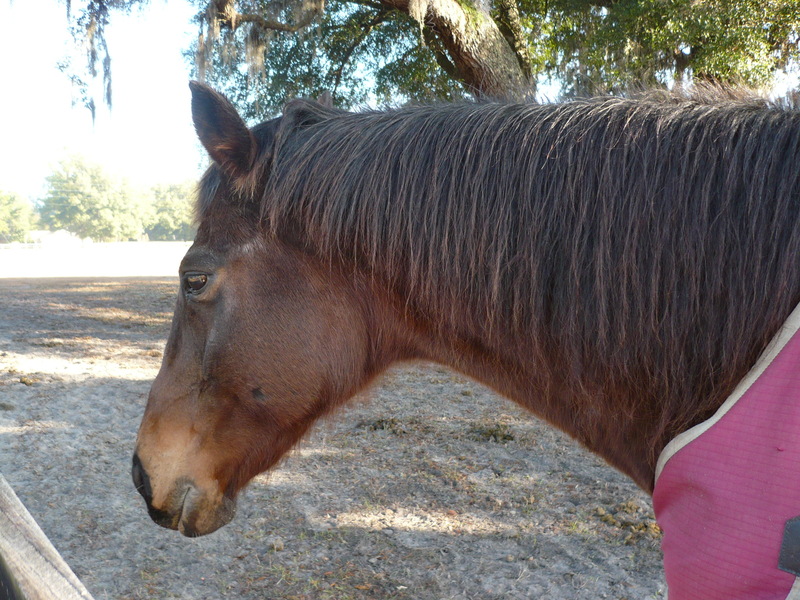 Dorothy is starting to have some doubts as to whether or not he will be an intermediate horse. In fact, she may even make me take him Novice at our first show this weekend, just to work on his ability to focus and not have to worry about the size of the fences. We will have to see how the week goes. I know that some of you are wondering what the big hang-up is. What is he doing that is so bad? He has a very strong (mental) dislike of carrying himself. He does things with his body that make the rider (me) want to hold him up. He is such a light mover that Dorothy says it may just be that I lift my inside rein up 1 inch, and that would be enough for him to allow me to carry him without me even feeling it. His sensitivity has always been a huge issue, and Dorothy says it’s probably way more of an issue than I even know. So here I am……entered in 2 trainings and a prelim event already. My horse is not cooperating, and I have yet to jump a single fence since I have been here. I have a show in 5 days. So this is the plan for the week……. I will take lessons on Picadilly (Michelle’s Intermediate horse) this week so that I can practice on a horse that already knows about the “torture circle”. Michelle and Dorothy will ride Gus and work on his cooperation. Dorothy may ride Gus novice this weekend—-or maybe me. She says she doesn’t care if I get 1,000 points or if I get eliminated. Gus has to learn to listen even when he is excited and distracted. So …….week #1 has been interesting. I have learned more in one week than I ever thought possible. The riding has been a bit of a disappointment though, but I’m hoping week #2 will prove otherwise. Life at the barn in Florida is not exactly what I pictured. At first I was worried about what I would do with all of my spare time down here. I had visions of reading books, laying by the pool, taking long leisurely walks, and maybe even visiting some friends who live down here. Would I get bored??? I am actually laughing out loud at that last line. A typical day in the life of a barn girl looking to someday move up to intermediate in the near future looks a lot like this……..
Hit the bathroom for teeth brushing etc. It’s now 5pm or later…. Horses get grained again, turned out in fields with overnight blankets, and given fresh hay and water in stalls. Joy goes to Starbucks or Panera to check e-mails and make phone calls. By the time I get in bed it’s past 11, and the day is ready to begin again.